The origin of Banh Chung can be traced to Hong Bang Dynasty – when the 6th Hung Emperor ruled the land (read Vietnam Early History). Sadly thinking he was too old to lead the country, Hung Emperor wanted to find the one to inherit his position and sit on the throne. Therefore, he held a cooking contest for his 21 sons, and who could fully satisfy his taste would be the winner. Most princes set out on their journey to find special, exotic and far-fetched food, except for Lang Lieu – the 18th son of Hung King, also the poorest and loneliest since he lost his mother at a young age. Not having enough money to afford such delicacies, Lieu just stayed around his house. Thanks to the help of a fairy in his dream, Lieu came up with 2 types of cake called ‘Banh Chung’ and ‘Banh Day’ and started baking exactly like what he had been told. On a spring day on which all the princes’ labor had to be presented, Lang Lieu and his wife brought Banh Chung and Banh Day to the emperor while other princes presented such expensive and unusual dishes. Others sneered at Lieu’s cakes, but Hung Emperor was deeply impressed by the special flavor of these cakes. He asked Lieu about the meaning of these cakes. Lieu said that he had cooked the glutinous rice, then molded it into a round rice cake, and called it Banh Day as it symbolized the sky we live under; he also cooked a square rice cake, stuffed it with cooked bean paste and ground meat in the middle, and called it Banh Chung, which was symbolic of the earth we live on. After that, Hung Emperor decided that Lieu was the winner and passed his throne to him. 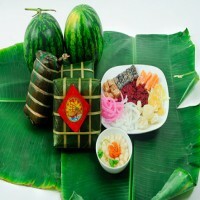 Since then, Banh Chung and Banh Day become traditional foods during the Tet holiday. 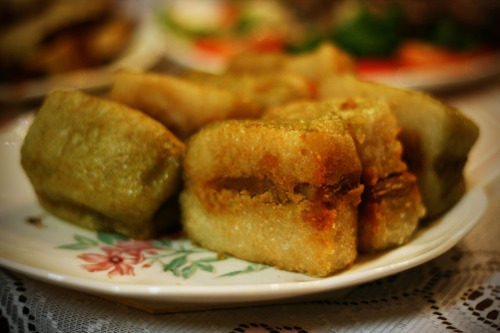 Banh Chung can be served as it is or fried to make ‘Banh Chung Ran’ – a delicious for such cold February in Vietnam. In some other regions, especially the Southern part of Vietnam, Banh Chung can be wrap in a cylindral shape with same ingredients, called ’Banh Tet’. A similar one to Banh Tet is ‘Banh Tay’ or ‘Banh Chung Dai’ (Long Banh Chung), served solely in the North with mung bean and little or no pork, hence, can be preserved for a longer period. There are also many variations of Banh Chung according to regions, religions and likings such as Banh Chung Gu (Humped Banh Chung) of San Diu people, Banh Chung Chay (Vegetarian Banh Chung) for vegetarians and Buddhists, Banh Chung Ngot (Sweetened Banh Chung), etc. In traditional context, the process of making Banh Chung is an occasion for Vietnamese family members to get together. Sitting around the warm fire, talking and telling each other past stories, they get ready for a New Year with lots of good wishes. 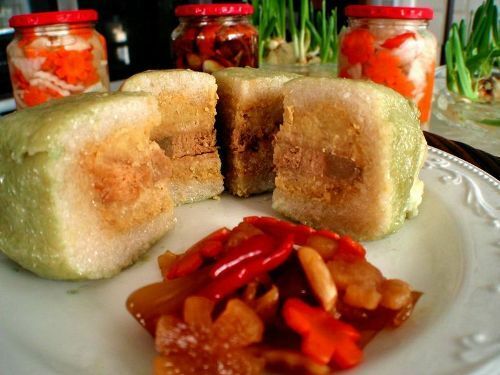 Although nowadays, not many Vietnamese families keep this habit anymore, Banh Chung is still an irreplaceable dish of Vietnamese ancestor altar on the occasion of Tet. It is the evidence of the Vietnamese loyalty and great gratitude to their ancestors.